Flexibility has more of an effect on the workplace than you can probably imagine. Ever hear of a compromise? It’s the practical foundation for conflict resolution. A compromise is a settlement of a dispute reached by opposing sides. Let us think of flexibility in these terms. We’re talking about an agreement between those who crave more flexibility in their lives and those who are reluctant to give it. The demand for flexibility is higher than what is actually seen in the workplace. More than half of the average full-time workforce population say that they don’t have enough flexibility in their day. By default, what impacts employees or their managers, will also affect the company in the long term. Give a little, get a little as the phrase goes. Today, we will be discussing flexibility in regards to lifestyle aspects that we at Office Libations deem to be most important. How Can We Define Workplace Flexibility? When you think of your average full time nine to five job what do you picture? Do you picture a boring desk job or something a little more upbeat with less paperwork and more action? No matter what your typical office looks like, every office job will have their own definition of workplace flexibility. The question worthy of the golden ticket now is: how does one define workplace flexibility? Is it by the amount of time that an employee can work away from the desk? Or can the amount of work that an employee puts out define how much flexibility they’re allowed? Well, this depends on a variety of factors. The ideal workplace will take in the needs of their employees. They will then use these needs to create a schedule that suits both the employer and employee. There must be a structure to the amount of flexibility allowed to employees. Furthermore, it must be easily communicated throughout the organization. This will set a standard guideline that you as a manager can then customize based on the individual. There are several types of flexible arrangements that we’ll briefly go over. To check them out in more detail head on over to our article on 8 Ways Your Workplace Will Change In 5 Years. Some require more desk time than others. Some will allow for shorter work weeks, variable working locations or minimal travel. One thing to note is that flexible jobs are fundamentally different than the gig economy. It’s true, short term contracts do allow for ultimate flexibility. But we’re talking about the difficulty of work-related flexibility in regards to a full-time job. Let us go more in depth about the implications of having flex time or lack thereof for full-time office employees. Taking care of your health is hard enough when you think about it. Throw in a nine to five full-time job and, let’s just say one’s health and wellness tend to fall to the wayside. Flexibility in the workplace can impact several critical areas of a person’s life and their well-being is one of them. 36% of over 1000 white-collar professionals in the US agree that it is difficult to make time for healthy living and exercising. And why can’t people seem to resolve their issues with their well-being? If you think it’s a result of minimal flex time in a person’s working schedule then you guess correct. According to the Sloan Center on Aging & Work at Boston College, there are several reasons why workplace flexibility is a must. Reducing stress is a major bonus. In a study with over 19,000 employees from distinct industries, burnout was significantly less prominent with the existence of flexible arrangements. The reason being that employees will have an easier time balancing their time outside of work with their duties on the clock. Reducing ‘negative spillover’ is also a bonus to creating flexible arrangements at work. This is a term used for the attitudes and behaviors that carry over from one role to another. For example, if you’re in a bad mood from something that happened at home, then that energy is going to bleed into the work environment. Lastly, increased flexibility can improve both physical and mental well-being. It’s pretty self-explanatory. Allowing for flexible arrangements at work allows employees more control in their lives. It allows them the ability to better care for themselves, for others, and to develop healthier behaviors in their lives. The one thing that all parents will appreciate out of their workplace is a flexible schedule. Parents overall are at a disadvantage when it comes to balancing their caregiving needs. Raising kids and working a full-time job can place an unreasonable burden that parents can’t shake. What was once resolved by a stay at home parent addressing any and all caregiving needs, is no longer a feasible solution. Now more than ever both parents are working full-time jobs to provide for the family. Most often, they struggle with addressing any last minute emergencies that arise due to strict job policies. So if the babysitter cancels last minute, then the responsibility falls on the parent to handle the situation. Especially when childcare becomes too costly, then being able to rearrange one’s work schedule can be very helpful. The availability of flex time is far and few, which is what tends to be the case with new mothers. They face the challenge of adjusting to a new lifestyle into their existing work routine. Although more than capable of adjusting their job with their familial needs, the support of their company goes a long way in retaining employees long-term. It’s easy to boast about all the benefits of offering flexible work options for employees. But if you’re one of the top managers, then you want to know how this impacts the company right? How is it that a company is able to see positive outcomes when their employees don’t even show up to the office five days of the week? It all comes down to productivity, turnover, satisfaction, and the well-being of everyone involved. Like we mentioned before, employees with more flexibility in their work schedules are less likely to experience stress and burnout. Naturally, this is good for them but this is even better for the company. This means that employees are more likely to keep their productivity levels high. Rather than hassling over a last-minute emergency or a forgotten doctor’s appointment, their mind is on their job instead. 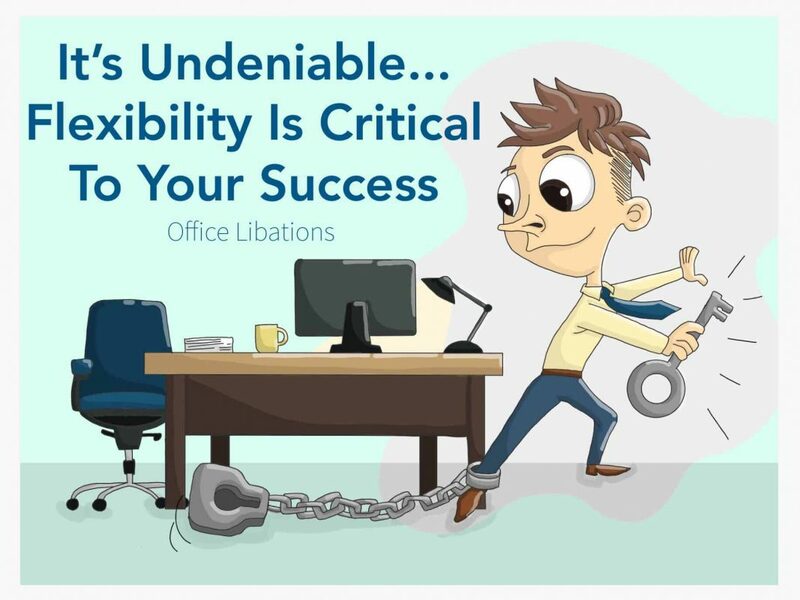 A significant amount of people leave their jobs due to inadequate flexibility in their working lives. Yet, by being considerate of an employee’s needs, a company can retain an exemplary team member without the risk of pushing them away. This will save the company time that would have been spent hiring and training someone new. Above all, satisfied employees tend to perform better than those who are aren’t. They feel their employer actually cares about them, that their ideas are valuable, and that they are able to make a difference in their position. Take a glance at why your employees will need some wiggle room in their work week. How many people on your team are working parents? How many of them are younger and prefer the freedom to spend their time as they like? Ultimately, you want to gauge the amount of flexibility you allow your employees with the quality of their work. Most likely what will happen is that employees will perform better once they’re not tied to their desk with a timer over their heads. The goal is to develop a fair structure that will cater to everyone’s need for flexibility. According to Joan C. Williams and Marina Multhaup, one way to achieve this is by creating a work-from-home policy that is ‘reason neutral’. This way, nobody will be able to pass judgment on a person’s reason for working from home. If someone has a death in the family and somebody else is falling ill with the flu, should we place more significance on one over the other? Simply saying that they wish to work from home should be reason enough. For working parents, this can include working from home three out of the five days in a week. For some, this can mean creating a shortened week depending on the progress of a person’s work. Others are simply content knowing the option to work remotely for the day is there on the table. This will be enough to satisfy them and give them peace of mind. Always have a way for your employees to check in and to maintain steady progress whenever they are not in the office. Set a framework in place to ensure that they are accomplishing their work in a timely manner. For example, scheduling monthly meetings to talk about progress or any issues that arise. Remember that the quality of employees’ work takes priority. As long as their work results in a positive outcome for the company, then they should be able to maintain a flexible schedule. We seem to be making our lives extraordinarily complicated when in fact, it actually doesn’t take very much to simplify our lives. Remember, flexibility requires a compromise on both ends for everyone to be happy. To empower an employee means to empower them to live their lives the way that they choose to live it. And if this means supporting them through a flexible schedule then so be it. Now more than ever, offices are paving the way towards innovative approaches for effective time usage. Why should employers control how a person uses their time when the time is relative to the person? It’s time to embrace a new day and age where flexibility is no longer a trend or a luxury, but rather a norm in our daily work life.